Umaru Musa Yar'adua after he berated him for backpedalling on a proposed gas liquefaction plant that had been earmarked for construction in Obasanjo's home state of Ogun. 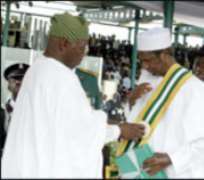 “This boy [Yar'adua] has turned out to be a terrible disappointment,” an angry Obasanjo was quoted as bemoaning to close aides, adding: “if there is one mistake that I have come to regret in my presidency; it was to make that idiot [Yar'adua] president; the boy is just too stupid,” sources privy to the conversation told Huhuonline.com. Such bland criticism was quintessential OBJ, who is known for his sometimes blunt and undignified utterances. The present quarrel is the latest in a series of personal setbacks that underline enduring rivalries between the two men as the Yar'adua government struggles to find its footing after two years of lackadaisical and lackluster performance following the controversial 2007 elections that brought Yar'adua to power. Huhuonline.com also learnt that a liquefied natural gas (LNG) plant at had been scheduled to be constructed at Olokola (OK LNG) in Obansanjo's home state. A native of Ogun state, the site of the future facility, former president Olusegun Obasanjo was one of the project's stoutest supporters before he left office in 2007. Since the election of Yar'adua however, OK LNG has been marking time. Obasanjo's vituperative outburst came amid increasing signs that the Yar'adua government was no longer interested in the project. At the instance of Yar'adua, Nigeria's Minister of Petroleum Resources, Dr. Rilwanu Lukman met recently with stakeholders, and on the threat of serious penalties, tasked them to either meet the country's rising demand for electricity and petroleum products or see their operational licenses revoked. To which end, British energy company, BG Group Plc which owns 14.25% of the project alongside Chevron and RoyalDutch/Shell said it was putting its operations on the Olokola project on indefinite hold, after failing to make progress in talks with Nigerian government officials who insist on devoting gas resources to electricity projects rather than to gas liquefaction plants whose output would be earmarked for export markets. To make matters worse, BG also announced it is reducing its involvement in the Olokola LNG project, meaning the plan for the liquefaction plant could be dropped altogether. In early September, BG cut its Nigerian payroll by 25%. The job cuts followed the decision, announced in late July when the group published its quarterly results, that it would slow its involvement in the OK LNG project. A final investment decision on OK LNG was to have been made early this year. It has been pushed back, but BG's decision to distance itself from OK LNG casts doubt on whether Obasanjo's pet project will ever be built.